There are three things that you can count on when it comes to Aniplex. You might only consider one, the price which tends to be inflated way above the content put out by their rival distributors in the US, but there is more. You can also count on the best quality disc authoring in the business, with anime looking so good on disc that it puts companies like Funimation to shame. The final thing is that they tend to go for those shows with production values, both audio and visual that makes the most of the disc authoring. Not for them the by the numbers shows, the identikit genre mash-ups that come out each season. An Aniplex show has got to look good. 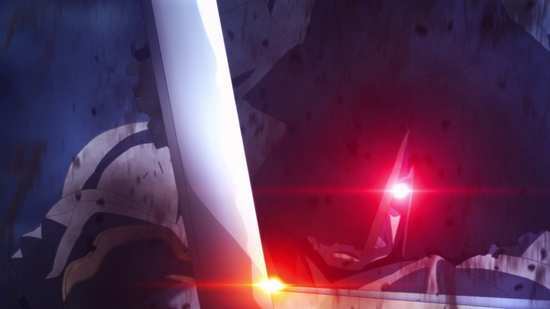 When it comes to Aniplex shows being distributed in the UK, the content is always the same, but thankfully, the price tends to come down to reasonable levels, and even if the discs are authored locally, or in Australia, they’re working with Aniplex materials to begin with, and the resulting discs are still of high quality. 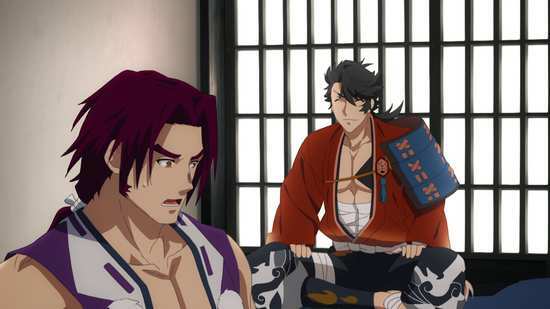 On the surface, there wasn’t a lot to get excited about with Katsugeki/Touken Ranbu. After all, it’s another in that peculiar genre of shows that anthropomorphises inanimate objects and makes a story around them. In this particular show, it’s swords that become elegant and pretty men. That doesn’t usually ring my bell, but once again, it was the Aniplex credentials that made me sit up and take notice. 1863 was a turning point in Japanese history, the era of the shoguns, the history of the samurai was coming to an end, and Japan was poised to the join the modern world. Only it turns out that some think it’s a bad idea. The Time Retrograde Army is being sent into the past to change history, to keep the samurai in power and keep the foreigners out. To keep history on track, ancient, famous Japanese swords have been made manifest as warriors in their own right, and have been sent into the past to find and defeat the Time Retrograde Army. Thirteen episodes are presented across 2 Blu-rays from MVM. The animation is presented in 1.78:1 widescreen 1080p on these discs, and the transfer is just what you would expect from an Aniplex show, even after going through the Madman/MVM localisation process to Region B. The image is clear and sharp, there are no signs of compression or aliasing, and I saw no signs of banding either. 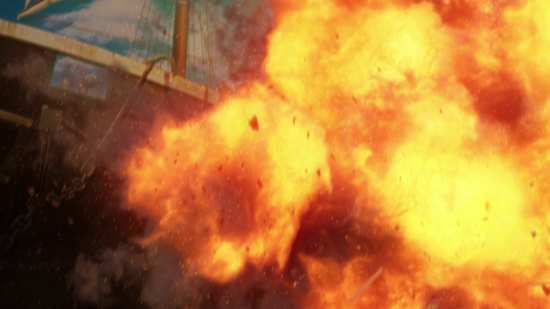 The quality of the animation demands that much, with excellent detail, rich colour, and with splendid action sequences and effects shots. This is an anime with sky-high production values and it tells on these discs. It’s up there with the Fate/Stay Night franchise, especially the recent instalments in terms of imagination, world and character design. You get the choice between PCM 2.0 Stereo English and Japanese with optional English subtitles and a signs only track. I stuck with the original language, and was happy enough with the actor performances, the action sequences and the show’s music. The stereo does a good job in expressing the battle sequences and the various sci-fi effects. The subtitles are accurately timed and free of typos. The discs present the episodes with animated menus. The extras on disc 2 begin with the episode previews, 9:01 of them in total, comedy in videogame style (the show is a videogame adaptation). 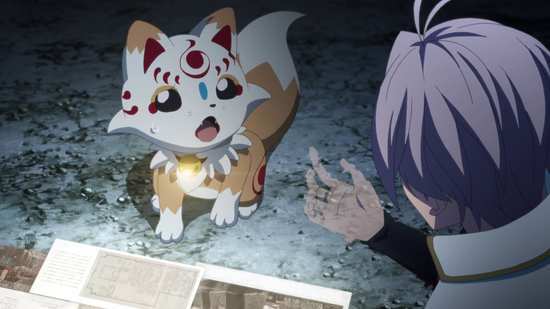 You get the textless credits, and there are Madman trailers for Occultic;Nine, Attack on Titan S2, Tales of Zestiria: The X, Blue Exorcist Kyoto Saga, and the Madman Anime Festival. I hope you’ve swotted up on your Japanese history; you’re gonna need it. 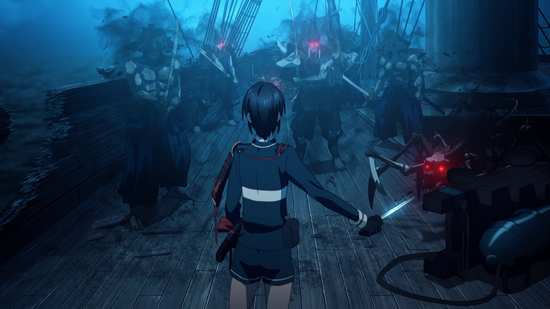 More and more mobile phone games are being adapted to anime, which is a bit of a head-scratcher, as mobile phone games are hardly the pinnacle of narrative game development. There’s one scene in the show where one of the characters is injured, goes back for medical treatment, and the healer says that ‘they need more tokens’. That’s the kind of line that can throw you out of a story. Still, the mobile phone game must be popular, as this isn’t the adaptation. 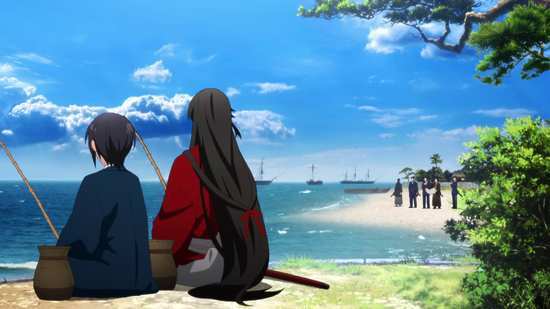 Katsugeki/Touken Ranbu is the spin-off from the adaptation. 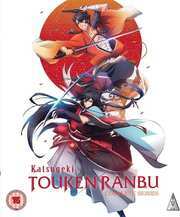 Touken Ranbu Hanamaru was produced by studio Doga Robu, and was released in the US by Funimation. It hasn’t had a UK release as yet, although its second season was streamed last year and licensed by Funimation as well. The premise is the same, but it follows the anthropomorphic swords on their downtime at the Citadel in 2205, in between their missions to thwart the Time Retrograde Army. In other words, it’s a slice of life show; cute sword-guys doing cute sword-things. 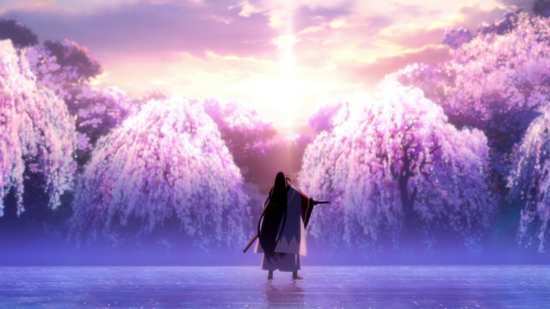 Katsugeki/Touken Ranbu is about the missions, it’s about the swords travelling into the past, fighting the Time Retrograde Army, and trying to keep history on track. It’s basically Timecop with swords. 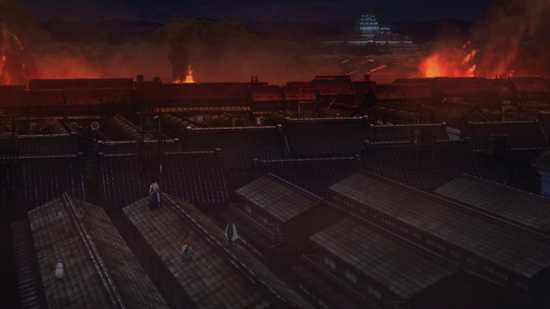 Studio ufotable do the honours for the spin-off, hence the earlier allusions to Fate/Stay Night, and they really do the action sequences and the historical settings justice. I haven’t seen the original series, but given the differing genres, I suspect they may be two completely different animals. Katsugeki/Touken Ranbu may be more faithful to the blurb on the back of the case, but it’s not a great show. 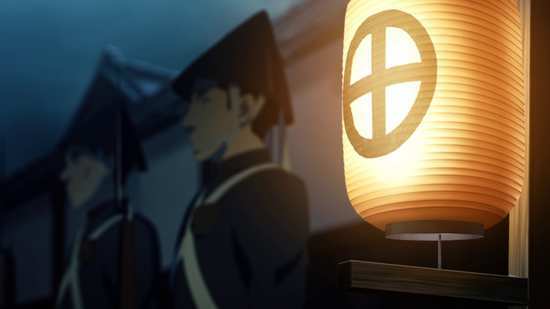 As I initially said, you do really need to know Japanese history to make the most out of the story; otherwise it’s hard to invest in the characters trying to keep a totally alien history on track. These are names and events that I personally have little to no knowledge of. You just have to take on trust that epoch shaping events will be altered if the wrong butterfly is stepped upon. The biggest problem with the show is that the threat is utterly faceless and motiveless. Sure the Time Retrograde Army is acting to uphold the Shogunate and prevent the Imperial Restoration, but we don’t know why, and when the soldiers of the Time Retrograde Army appear for our heroes to cut down, they are all in the form of CGI wraiths, monstrous, dark figures with glowing red eyes and no personalities that disappear into a puff of black smoke when killed. Sure, that’s how videogames work, but in terms of storytelling the only conflict and interpersonal drama there is to have in the show is between the mutually abrasive personalities of the Swords themselves. It’s contrived and obvious, a clichéd presentation of characterisation, shorthand for anime comedy, and while it is watchable, I really did think it was another show just going through the motions. 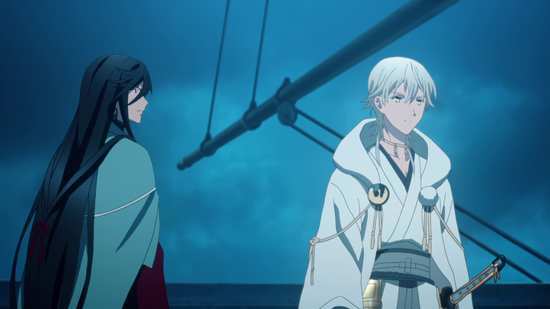 Katsugeki/Touken Ranbu saves its real moment of drama, the hook of the show for the final four episodes. The mission is to keep history on track. 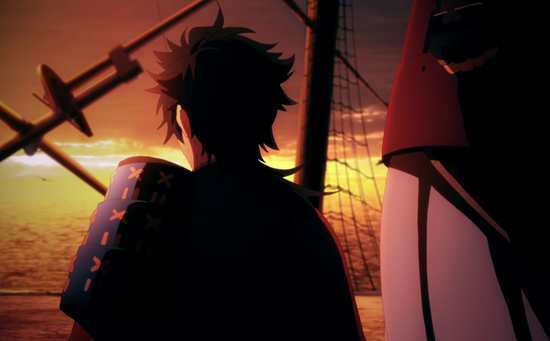 The heroes are all swords from history given human form, and it appears only they can travel through time without deleterious effect; certainly their master Saniwa can only survive in the past for brief periods before having to return. So it’s down to the swords and their cute mascot animals/pets to save the day. 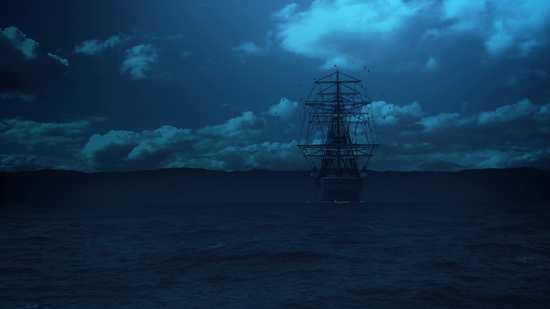 They have a challenge reconciling the collateral damage they leave in their wake with completing their missions, but it’s when they run into their original owners that things get complicated. These are all swords from Japan’s past, so it was inevitable that they’d run into their original owners, people for which they have lingering loyalties, and they are torn between keeping history on track, and saving their former masters from their original violent fates. For two of the swords, Kane and Kunihiro, this all comes to a head at the end of the collection when they run into their former master, Toshizo Hijikata of the Shinsengumi. Now this is one bit of Japanese history which I have picked up thanks to countless anime like Gintama and Hatsuoki. 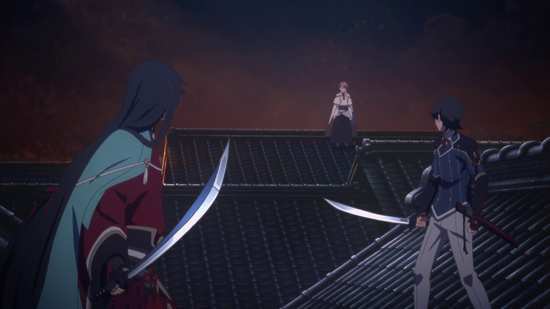 My attention did perk up here, and the dilemma that Kane and Kunihiro faced, choosing between protecting history and their former master gave the show its first moment of real drama when they chose different paths, and wound up facing off against each other. You have to wait ten episodes for the good bit of the show, so unless you’re really patient, it might not be worth the wait. Katsugeki/Touken Ranbu has a knock-out, can’t fail premise, but in the end the mobile phone game origins stop it from reaching its potential. It’s a well made, well paced, action packed dud.